The Best Rocking Chairs Start With Great Design. Here's How It's Done. The Best Rocking Chairs are Created Through an Extensive Design Process. The design process I use to make the best rocking chairs for you involves research, inspiration, and years of hard work building prototypes. Research successful rocking chair designs and learn what makes them appealing to people. It's important to understand what makes these designs succeed in order to incorporate those aspects into a new one. Today's most popular design of a custom rocking chair is one created decades ago by the late, world-renown woodworker, Sam Maloof. His design and construction method are copied by many custom rocking chair makers. The reason why? It's a good, enduring design with great features like lower lumbar support, overall balance and visual interest. It also challenges the craftsman by requiring a lot of skill and precision to make properly. Most of these craftsmen are satisfied with small alterations to this well established design rather than developing an entirely new one of their own. Determine which features of the chair must stay and which are alterable while still maintaining appeal. This step involves looking at the whole rocking chair in a different way. Instead of remaking an existing design with very slight alterations, the designer/craftsman starts by seeing the overall function of the rocker and then develops the idea from there. In order to make this work, possible alterations are constrained by the qualities desired in the new chair. Things like sound operation, strength and good looks are very important to keep. A new design is then sketched and evaluated. In my case, the rocker design I've created focuses on the shape of the human body. With this information in mind, a first prototype is drawn up. Build a rough prototype to see if the design is workable in both structure and style. The creation of this prototype is exciting because it's the first 3-dimensional step to producing a very pleasing rocker. It's also quite challenging and slow because many new things like joinery, grain orientation, balance, etc., have to be tested and retested. The ability to put the design together in a solid way is critical. Eventually, (when the prototype is completed) a decision has to be made whether to pursue the design further or scrap the idea and start over. It must seem "right" initially or it will fail. The best rocking chairs cannot come out of a bad design. Build a second prototype and introduce it to the public. Gauge reaction, take notes and apply modifications to the next prototype. This is where the rubber hits the road, so to speak. It also involves seeking input from many different people. As a member of a large woodworking club, I have a built in venue every monthly meeting in which to display these hand made rocking chairs. These men and women club members offer honest, valuable assessments and suggestions which translate into designing a better rocker for YOU. 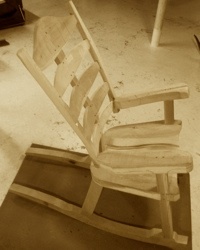 Finally, step 4 is repeated for several more prototypes until a stylish, sound and very appealing rocking chair emerges. One that excites you and offers all the benefits desired. This process brings out the best rocking chairs.